This event has been run annually for many years on 1st January at 12noon. The tradition of the race goes back to the 14th Century when, in a severe winter, the Lord of the Manor encouraged locals to go out into the surrounding countryside and forage for food and fuel. Last years race was won by Andy Pybus and Alan Redman. The wheelbarrows are provided by the race organiser. 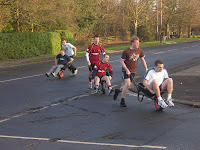 Each team consists of two people, one person in the barrow and one pushing. They are expected to change over halfway round. The race usually lasts about 12 minutes. The race starts from outside the Blackbird Inn on the North Road. The barrows are pushed up the North Road to Thornhill Road then down Thornhill Road to the finish beside the Blackbird. A junior race is run from the shopping precinct on Thornhill Road to the finish while the main race takes place. We have lost track of the Silver Salver trophy for the winners and would welcome its return. Prizes are also given for the first ladies' team and the junior race. It is traditional that the race is started by the Lord of Ponteland, who is elected for the day. The Ponteland 41 Club, with the help of Ponteland Rugby Club, has organised the event for the last few years. Contacts: Race Organiser – Jonathan Goodwill tel: 825859, Chief Marshall – Andy Anderson tel: 871844.